MANCHESTER, N.H. – U.S. Sen. Bernie Sanders Friday picked up the endorsement of former NAACP President and CEO Ben Jealous. Jealous was the youngest-ever president of the century-old NAACP, serving from 2008 to 2013. He’s credited with leading the storied civil rights group back to prominence. “I think the proposals that we have brought forth in this campaign are proposals that will go a very, very long way to improving the lives of people of color in this nation,” Sanders said. The senator cited raising the minimum wage, ensuring pay equity for women, creating millions of decent paying jobs, Medicare for all and tuition-free public colleges and universities among the plans he’s put forward that would directly impact communities of color. Jealous will travel to South Carolina on Saturday for a series of campaign stops and events throughout the Palmetto State. 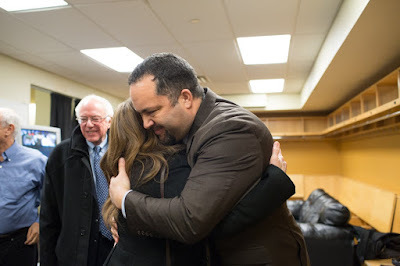 To read Ben Jealous’ prepared remarks, click here.